This well-fitting muzzle is handcrafted. It is made on the basis of special strong metallic construction to maintain the shape of the muzzle. Our craftsmen use only true full grain leather. It is carefully stitched and riveted by hands of our craftsmen to prolong its service life. Due to its special design you may use it in everyday life and during obedience/agitation/protection training. 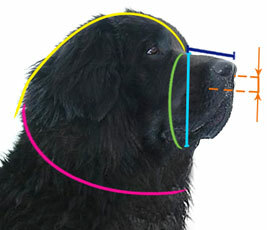 There are big holes, the nose part is open so the air circulates freely and your dog won’t suffer from lack of air but it will be unable to bite anybody.. The inside upper nose part is padded to prevent its rubbing. So nothing will disturb your pet in this muzzle. If it is worn properly, your dog is unable to take it off with its paws. We know that it is difficult to believe but if you read more detailed information you will be left no hesitation. Choosing the muzzle for your pet is very important step in your dog’s training. Before buying the muzzle careful dog owners think about the main characteristics that they want their future muzzle have. Firstly, it has to be durable not to be broken during, for example, agitation training. Secondly, you may use it both for training and for walking. Thirdly, it mustn’t bother your dog during training or everyday walking. Fourthly, it must be well ventilated. Fifthly, it will be good if the muzzle is time-saving. So, the list of demands is endless and the solution is simple. 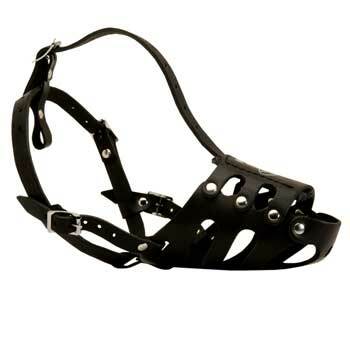 Buy our Extra Durable Leather Dog Muzzle for Dog and you will see that one muzzle may satisfy all the requirements. 1. It is time-saving because due to simple adjustment it won’t take you much time to fit the muzzle and to put it on and off the dog. 2. It is money-saving. Wearing this muzzle your dog will be unable to pick up different strange objects that may harm your pet's health and make your vet visits more frequent. If you follow some simple rules you won’t buy any new muzzle for a long period of time. Fit the muzzle properly so that your dog won’t be able to dislodge and to chew it. Polish the muzzle with water repellent after water contact. Don’t expose it to extreme sun light for a long time. Don’t leave your dog without supervision when it is muzzled. © 2017 Dog Muzzle Store Online. All Rights Reserved.